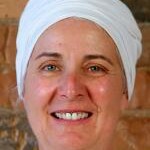 Karan Kaur brings her training as a massage therapist into her understanding of yoga and alignment. She is a certified Level I, Level II Kundalini Yoga Teacher, an Educator promoting ‘The Beyond Addiction’ and ‘Healthy Breast Programs’, and an intern with the Kundalini Research Institute’s Aquarian Trainer Academy. An avid yoga practitioner for 25 years, she discovered the teachings of Yogi Bhajan in 2005, and thus began her journey with Kundalini Yoga. Appreciating the physical health and emotional benefits one can benefit through regular practice of pranayam, kriya and meditation, Karan Kaur inspires her students to transform their lives through the sacred science of Kundalini Yoga, while expanding their awareness of the world within. She teaches with enthusiasm, grace, passion and joy.